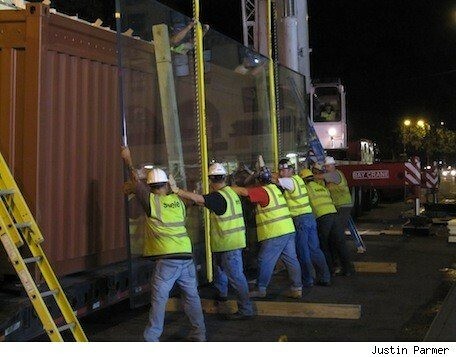 TUAW posted has this image and a short video, embedded below, of workers unloading huge glass panes outside Apple’s iconic Fifth Avenue store in New York City. The store lost its iconic glass entrance two months as Apple has been working to upgrade the cube to a more seamless appearance. Although the main entrance is closed, the store itself has been open all this time. The upgrade will reportedly cost the company $6 million, nearly matching the seven million dollars Apple allegedly paid back in 2005 to assemble the glass cube entrance. They want to reduce the number of glass panes from 90 to just 15, three per side, per released company plans.